TV and theater producer Jenna Segal had a dramatic financial shock as a child. Now as a financial grownup, Jenna takes her cue from that experience to make sure the creative ambition of her productions is in line with financial realities. Read more about Jenna Segal! She'd throw me the codes for the budgets and I would be able to look at each bill and really get to understand what it was costing for the networks to do what they were doing. That's what gave me the ability to do the job that I wound up getting at MTV, because I understood the cost of production and how to move money around, how to budget, figure out how to make a projection work on the amount of money that we had to work with. 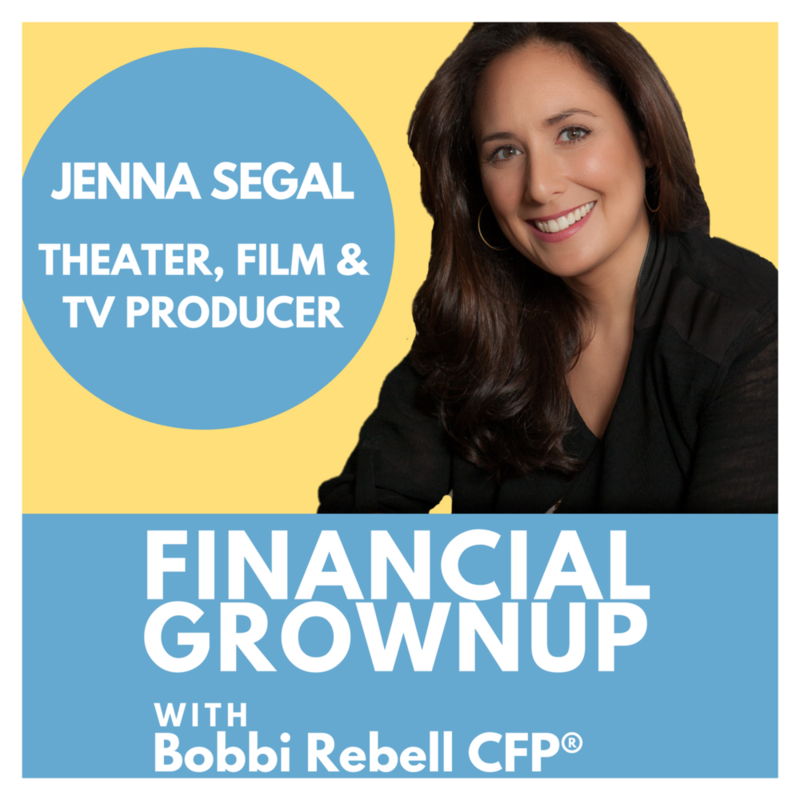 You're listening to Financial Grownup with me, certified financial planner, Bobbi Rebell, author of How to Be a Financial Grownup and you know what? Being a grownup is really hard, especially when it comes to money. But it's okay. We're going to get there together. I'm going to bring you one money story from a financial grownup, one lesson and then my take on how you can make it your own. We got this. Hey friends, that was film, TV and theater producer, Jenna Segal talking show business number crunching. Welcome everyone to the show, if you have not already, please hit that subscribe button so you don't miss any upcoming episodes. If you are new to the show, great to have you. As our returning listeners know, we keep the episodes short because we know you're busy. About 15 minutes, just give you a story, little context, something to think about, a take away, and an everyday money tip. Of course, if you have more time, listen to a few episodes. All right, let's get back to today's money story. Jenna Segal's long list of productions include, Gigi on Broadway starring Vanessa Hudgens, the recent revival of Les Liaisons Dangereuses, hope I said that correctly, as well as the off Broadway show, What We're Up Against. She has also had stints at Viacom including MTV and Nickelodeon, as well as in news. Places like CNN and CNBC, whereas you will here, she worked for my cousin Robin. Hey Robin. Also, no matter how fabulous this show is, you're going to learn from Jenna, there is still math and a lot of people that have to get paid. If you can't crunch the numbers, the show does not go on. Jenna Segal got her ambition early on and it amped up, when as a teen her family had some big financial drama. Now her career, still has drama just also comedy, mystery, love stories and all that showbiz stuff. Here is Jenna Segal. Hey Jenna Segal, you're our financial grownup, welcome to the podcast. Hey Bobbi, how are you? It's so exciting to be on. I am excited to have you because you have so many interesting projects. You are the head of Segal NYC which is Broadway Production company, you're also a TV producer and you've got a number of projects going on right now. I have convinced you to give us a little sneak peak on one project, tell us a little about that very famous person you're working on a project about. Yes, I'm so excited. I am working with Daryl Roth on a brand new play called Gloria. Which is about the one and only Gloria Steinem. It is going to be at the Daryl Roth theater downtown in New York City in the fall. Very cool. I want to hear more about some other projects you're working on but first let's do your money story. It is something that unfortunately many people can relate to and that is when a parent loses a job. You were just 16, tell us what happened. When I was 16, I grew up in New Jersey and just kind of a regular existence. My dad had a great job working in the fashion industry and the whole industry, much like today, went through a major transition. The entire industry of the middle man started falling apart because Target and Walmart were doing networking, going directly to factories all around the world to find people to manufacture their goods. Financially for our family it was just a major, major change. So what did that mean for you? What was the changes for you? Well it just meant that money wasn't coming easily anymore. And at a certain point, it also meant that my college education wasn't as secure as I had thought. I wasn't getting a car when I turned 17, I was sharing a car with my dad where I would drop him off so he could go into New York City. And I would pick him up at the end of the day. But it especially meant that I went out and I had always loved working but started, instead of doing you know one job that was babysitting after school, I went out and got three jobs. So I worked on the weekends at the local bagel store where I'd get there at five o'clock in the morning and Saturdays and Sundays I would talk to the first people in at five and make their bagels and go through the soccer lines and everything else. Of course. I still know the Happy Birthday song. I also grew up in New Jersey of course though. Yes totally. And I was able to do obvioulsy similar things there. And I also worked at Little Ceaser's when it first opened until I just couldn't take it anymore because I smelled so much like pizza. And I was a nanny after school for a single mother, not my Freshman year of college but starting my Sophomore year of college, I continued really doing that as well. Trying to take all of my classes in two days and then I started working at CNN five days a week. At first for an unpaid internship and then hostessing at night. But it really was a wonderful experience because it changed how I viewed being able to support myself. So now you're a Broadway producer. Having this background with the needing to earn money in that kind of situation, do you look at budget items differently, would you spend differently? Oh totally. When I look at Broadway, every single aspect of what you're doing has to relate to the return. And then it has to relate to the artistic integrity of the piece that you're doing. I would say even at MTV, where I started in the 90s in Los Angeles, it was always about taking whatever the budget was, being able to respect the artistic integrity of the director or the writer. And make sure to get them what they wanted visually but how to do that within the parameters of what financially needed to be achieved. And that's always a really huge challenge I think for many people who get out of film school and budgeting is generally not significantly taught there. And I have always felt that for creative people, having that ability to understand the parameters around a budget, especially for large corporations who have real risk assessment needs. And cannot just go out and shoot without permits and know that they're not going to majorly get in trouble or use music that hasn't been cleared. And just take the risk that they're not going to pay for it or have somebody come in and not have insurance for those people to make sure that if they get hurt, they don't take the risk and have that actor or that camera person or the audio person not have backup. So that if they get hurt, you're able to financially take care of them and not wind up getting sued and having it put you into major financial jeopardy as an independent producer. All of those things are what I'm thinking about all the time. There's a lot of economics behind the scenes, I mean pun intended. Yes, 100 percent. I started in political talk shows in Washington D.C. with actually, I completely forgot about this, your cousin Robin [inaudible 00:08:06]. The absolute best producers I have ever worked with, incredibly smart. But Robin loved the creative and she hated the financial piece. And the best thing that Robin ever did for me and my production career and I credit her for this all the time. Is that Robin threw the bills at me. And she said, "You deal with this. You code it." And coding is, in the networks or really in any company that you work for, it's a way of accounting for each individual expenditure you have so that when they put it through the massively gigantic books in the big picture, they're able to understand what they're spending on everything. And so she'd throw me the codes for the budgets and I would be able to look at each bill and really get to understand what it was costing for the networks to do what they were doing. That's what gave me to the ability to do the job that I wound up getting at MTV in its heyday. Because I understood the costs of production and how to move money around, how to budget, how to figure out how to make a production work on the amount of money that we had to work with. What is the lesson for our listeners from this? I think the most important lesson is to make sure to key into where you're real financial acumen is. And that could come from any kind of experience in your life. See why that moment resonated for you and how you can move that moment forward for what you're doing at work or what you're doing in your home. Look at your finances and figure out how you can make happen what you want to make happen, even if you have a minimal amount of money to do it. And even if you're in a creative field, I mean one thing that I notice is that you know, even the creative people need to understand the economics behind that creation. Oh 100 percent. And what I like to say is that I, what my real skill set wound being is that I am an excellent translator. Through my experiences, I was able to understand financial people and understand what they were getting at and why they were getting at why you could or couldn't spend money on something. And I was able to talk to creative people and explain to them why we did or didn't have the money to do what they wanted to do but how we could creatively come up with a solution for how to get what they wanted in a different way within the money that we had. And I think that lacking often creates the best creativity for how to find creative ways out of a situation. All right so Jenna, what is your money tip? Pick a number and create an emergency fund. When I was leaving Washington or decided I wanted to leave for Washington to move out to LA to begin working outside of political talk shows, I worked in a job where I only got paid once a month. And it really taught me how to budget wisely over the course of the month because of course I was living paycheck to paycheck. Knowing that I was going to get money at the end of the month, it made me think about how I could save to get to the 2000 dollars that I thought that I needed to get out to LA. And ever since then, I always make sure to have 2000 dollars in the bank at all times as my getaway car so to speak. Get somewhere, right. So it's not a traditional emergency fund where if you lost your income source, you would have six months to live on. It's a get out-of-town fund, basically. Exactly, but it's not, I don't want our regular listeners to be confused with these same kind of emergency fund that's like for if you're in dire straights, this is your get out of town. Like yeah. Literally like quick cash fund. Literally I need to change my life tomorrow, I have this money. Awesome. Well you have a great life right now because you have so many amazing projects going on. Tell us what's going on with Segal NYC and you have another big thing that's happening the fall of 2018, I think. Yes. With Segal NYC, we're going to be producing the fall, Gloria as I mentioned. And then other projects that are brewing in the background and then I have also started with a partner, Gatherer Entertainment which is going to be a digital network for women. And we have a really fun newsletter at Gatherer TV dot com. If you're interested. What kinds of projects are you going to have? On Gatherer, it's going to be everything from unscripted shows to scripted but all in the original stuff that we're going to be doing is all going to be in shorter form. And we're working with really talented writers, some with names you know and some who don't. Focusing on women, the world that women live in right now. And really things that are going to be instrumental to them in their lives that aren't necessarily being talked about. That sounds mysterious. All right I can't wait. I think it's unveiling the mysteries. That was a good tease, Jenna, good job. All right, where can people learn more about you and about Segal NYC and Gatherer and so on? Sure so Segal NYC, it is Segal NYC dot com, Gatherer is Gatherer TV dot com. And then I am on Twitter at JennaKatzSegal and Facebook and Instagram. Although I don't use Instagram as much. I know I really have to get on it but I just haven't gotten there yet. Well I think you'll get there and you have great things happening and coming so thank you Jenna Segal. Thank you so much. It was so good talking to you. Such a fun interview, can't wait to go see Jenna and Daryl Roth's Gloria production in the fall. Financial Grownup tip number one, Jenna worked as a teen in multiple jobs because she had to. But it's also often a great learning experience for teens to work just because they get exposed to the universal basics of being an employee. Show up on time, be reliable, follow directions, all that stuff. It can also motivate teens not just to work hard, but also smart. And to have the best career that they can. I know having to memorize the price of every baked good at the Wycoff Bakery in New Jersey as a teen definitely motivated me. And I know my future in food service. Financial Grownup tip number two, emergency fund. So Jenna talked about having 2000 dollars as an emergency fund. We then, renamed it the get out-of-town fund. She basically was talking about money to buy a plane ticket and have a little spending money if you got to go. But as we also mentioned, everyone actually also needs what we traditionally call an emergency fund in case your income stops for some reason. So in a perfect world, it would be about six months, more or less depending on if you are a single person, then you might need a little more. If you have double income, you might need less because the odds of losing both incomes at once are lower. Now if that is not a reality right now and it's not for a lot of people, let's be honest about it, if you don't have it, here is a plan B. See if you can at least get a line of credit that could be available to you. The catch is, you need to get the line of the credit ahead of time, as in now when you don't need it. If you're not using it and you don't take money out, you're not paying any interest so it's okay. But then you have it so you can tap into that money if you do have an emergency at much lower rates than say a credit card. And that's really important because right now we are in a rising rate environment. Thanks to everyone for joining us for another great Financial Grownup Podcast episode. To stay up to date on episodes and also catch our fun promo videos, follow me on social media. At bobbierebell on Twitter, at bobbirebell1 on Instagram, my page on Facebook is Bobbi Rebell. And I'm also working on that YouTube page so check it out and please subscribe, I would love your support. Jenna's start continues to rise in large part because she keeps a nice balance between the show and the business, so thank you Jenna for sharing with us and helping us all get one step closer to being financial grownups.